Keep a canine friend warm and dry in this sturdy doghouse. Our design features a dividing wall that provides complete shelter from wind and rain, and the shingled roof is removable for easier cleaning. In colder climates, you can even install sheet foam insulation beneath the floor for added warmth. 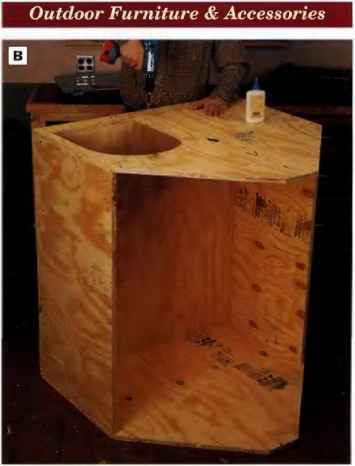 PHOTO A: Draw the arch top door opening on the doghouse front panel, and cut out the opening wltlt a jig saw. Drill a starter hole In the cutout area first, so you can Insert tte saw blade to begin the cut. 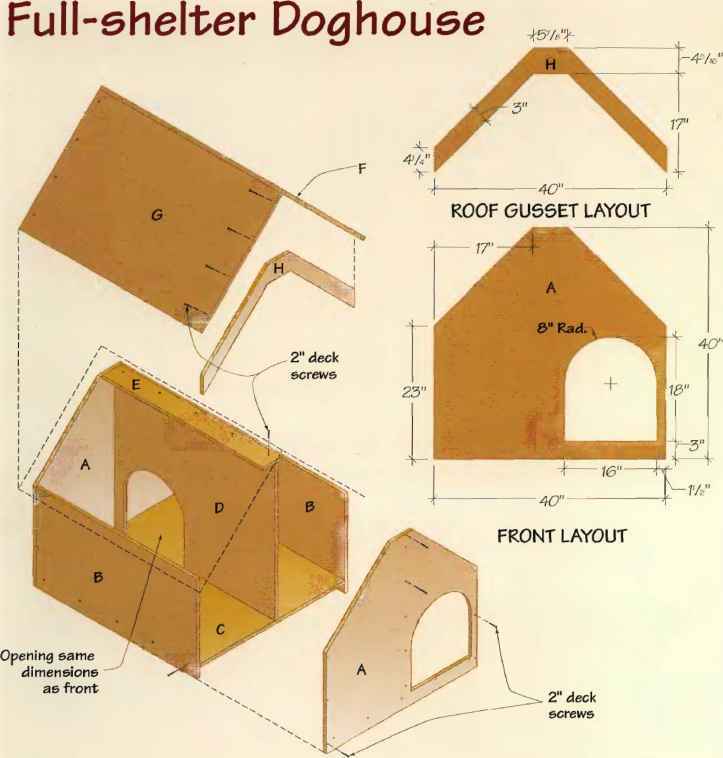 The proportions of this doghouse project are intended for housing medium to large dog breeds. 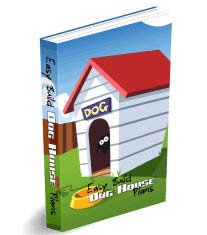 Contact a dog breeder or your local branch of the Humane Society for information on suitable doghouse sizes ior smaller dogs. 0 Cut two 40 x 40-in, pieces of plywood for the front and back panels. Follow the Front Layout drawing, page 364, to dr aw the angled roof profiles as well as the arch-top door opening. Cut the roof angles. O Cut the door opening in the front with a jig saw. 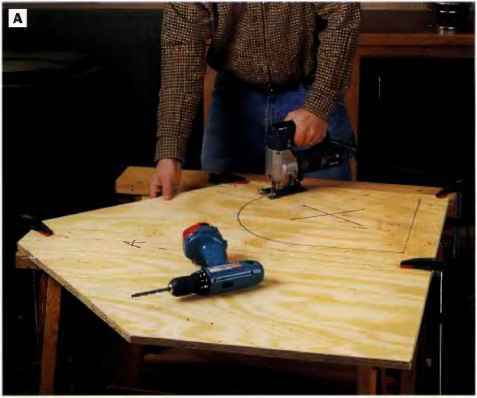 Start the cut by drilling a pilot hole in one corner of the door layout area, large enough to insert the saw blade for starting the cut (See Photo A). 3/4 x 42Vii x 23 in. 3/4 x 48 x 31 in. 3/4 x 38Vfc 1x 42^2 in. s/4 x 48 x 3014 in. 3A x 36K x 42H in. % x 215/Ï6 x 40 in. PHOTO B: Fasten the bottom panel In place between the front, back and side pieces with countersunk deck screws. Position the bottom 3 in. up from the bottom edges of the parts and so the top face is flush with the bottom of the door opening. © Hip and crosscut tlie two side panels, bottom and tlie interior brace to size. O Make the interior divider; Cut a plywood work-piece to size, following the Catting List dimensions on page 364. Lay the doghouse front pane] on the divider workpiece and use the front door- opening as a template for drawing a door on the divider. Locate the door so it's flush with the bottom edge of the divider and 2 in. in from the end. Trace the door on the divider and cut the opening. © Fasten the front and back panels to the sides. Arrange the parts so the front and back overlap the ends of the side panels. 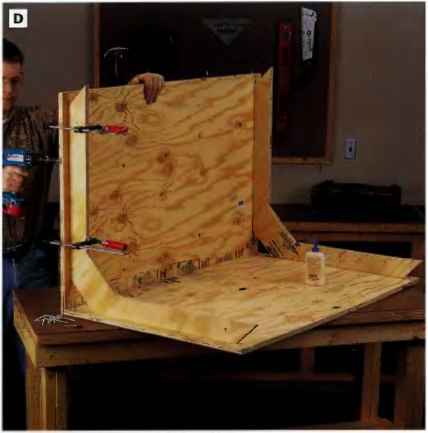 Spread moisture-resistant wood glue on tlie ends of the sides and clamp the four parts together. T) p: If you don't have clamps long enough to hold these parts together, stretch duct tape over the joints instead. Drill countersunk pilot holes through the front and back and into the ends of the sides. Attach the parts with 2-in. deck screws. © Install tlie bottom: Draw a reference line 3 in. up from the bottom edges of the doghouse assembly all the way around the inside of the structure. This line represents the fop facc of the doghouse bottom panel; it should align with the flat bottom edge? of the front door. Slip the bottom panel into position and attach it with countersunk deck screws driven through the front, back and sides (See Photo B). 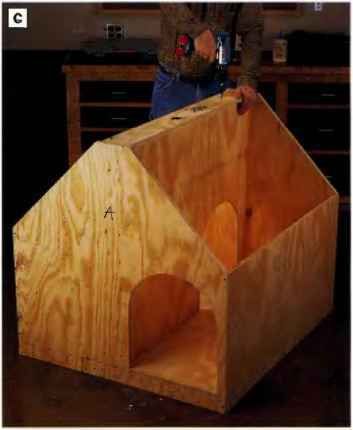 © Attach the interior divider: Draw vertical reference lines on the front and back panels for locating the divider inside the doghouse. Measure and mark these lines 20 in. in from the left side of the doghouse (when viewed from the front). 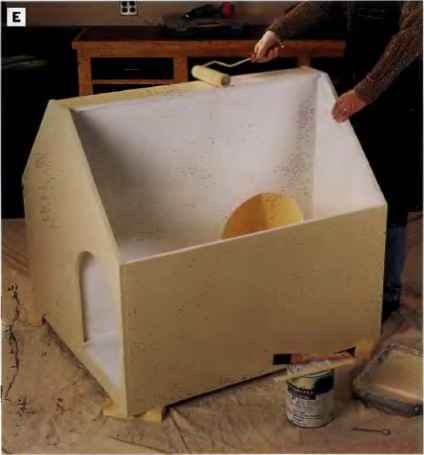 Slide the interior divider into position so the divider door is positioned near the back of the: doghouse:. Secure the divider by driving 2-in. countersunk deck screws through the front, back and bottom panels. © Install the interior brace: Set the interior brace so it caps the top edge of the divider and is centered on the short, flat top edges of the front and back panels. Drive 2-i.n. deck screws down through the brace into the divider as well as through the: front and back panels to fasten the brace in place (See Photo C). PHOTO C: Install the interior brace on the top edge of the divider and so It Is centered on the short, fiat top edges of the doghouse front and back. Fasten the parts with screws. PHOTO D: Assemble the roof panels and gussets to form the roof structure. Allow for a 1-ln. overhang between the ends of the roof and the gussets. Fasten the parts with glue and countersunk deck screws. PHOTO E: Prime and paint the doghouse surfaces, Inside and out. Seal the bottom edges with primer and paint, to keep the plywood from wicking up ground moisture. unit, to make cleaning out the interior of the house easier. A pair of gussets beneath the roof panels stiffen the str ucture and hold the roof panels at 90" to one another. O Rip and crosscut the two roof sections. Follow the Cutting List dimensions carefully—the roof panels differ in width so one panel can overlap the other at the roof peak, once installed. © Make the roof gussets: To lay out the gusset shape, mark a 20 x 40-in. rectangle on a plywood sheet, and follow the Hoof Gusset Layout drawing, page 364, to draw the shape within this rectangle. Cut out the gusset with a jig saw or circular saw. Use the first gusset as a template for drawing the second gusset shape, then cut out the second gusset. CD Assemble the roof panels: Spread glue along one long edge of the narrower roof panel, and set the wider roof panel against the first so it overlaps the glued edge and the parts meet at 90°. Drive countersunk 2-in. deck screws through the joint to fasten the roof panels together. © Install the gussets: Mark the inside faces of the roof panels with layout lines for gussets. The roof should overhang each gusset by 1 in. Spread moisture-resistant glue along the top long edges of the gussets, and clamp each gusset in place on the roof panels. Drive countersunk 2-in. deck screws through the roof panels and into the gussets (See Photo D). 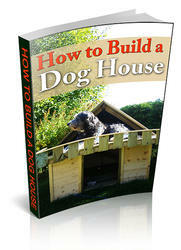 © Sand the doghouse inside and out, as well as ease any sharp cut edges, especially around the doors. 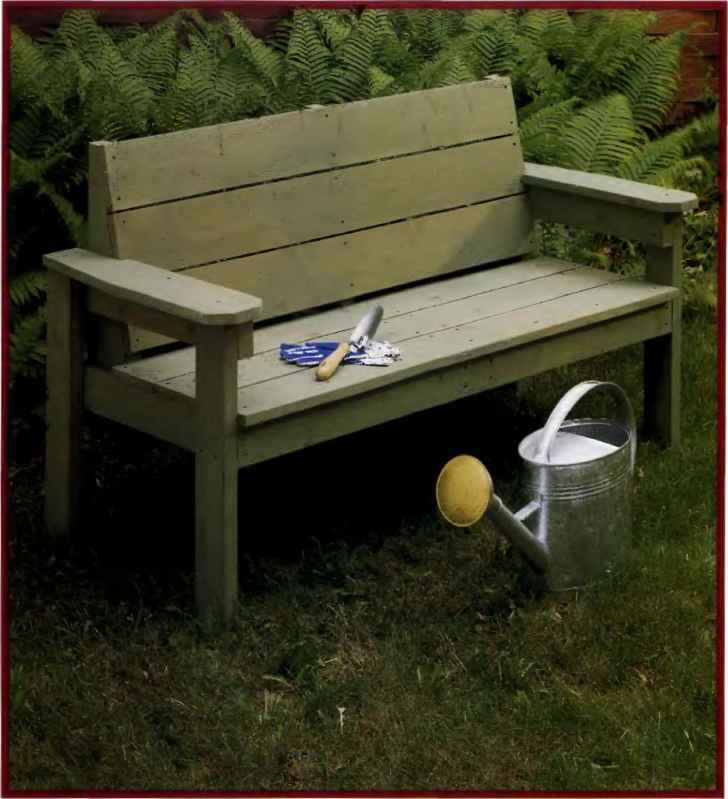 © Prepare the plywood for paint, with a coat of exterior primer. Prime all surfaces, including the bottom edges of the doghouse that will come in contact with the ground. Topcoat with exterior paint (See Photo E). PHOTO F: Staple a layer of building paper over the roof panels, then shingle the roof, starting from the bottom and working up to the peak. PHGTQ G: We stenciled the name of our project's future resident on the doghouse front. © Cut arid staple 15-pound building paper over the outer faces of the roof panels. Be sure the seams overlap at least 6 in. in the peak area to seal out leaks. © Install asphalt shingles over the building paper with roofing nails, just as you would shingle any roof. Start fit the bottom and work your way up the roof, overlapping each course of shingles and staggering the shingle slots (See Photo F). Protect the roof peak with a row of overlapped shingle "ridge caps" nailed in place. © Stencil the dog's name on the project if you like, to add a personal touch (See Photo tx). 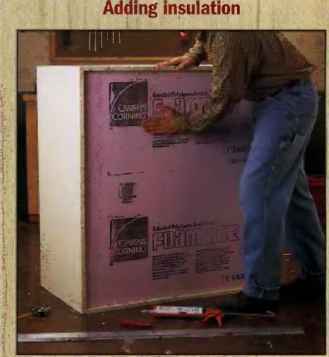 © In cold climates, install rigid foam insulation beneath the bottom panel (See Adding insulation, right). 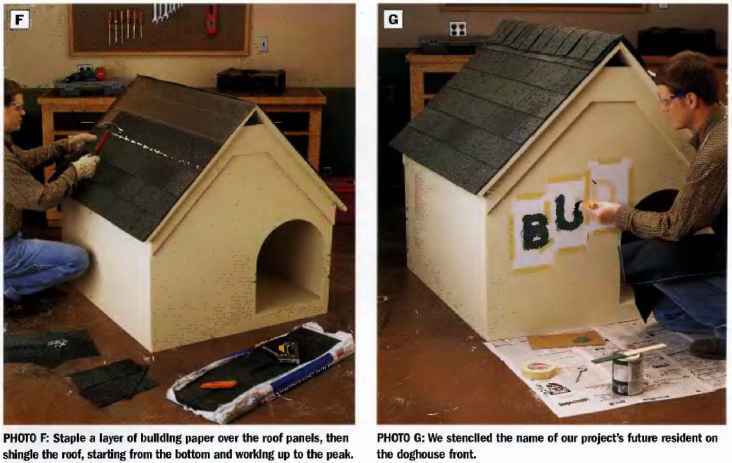 This doghouse project was designed to accept a sheet of 1-irr.-thick rigid foam Insulation below the bottom panel. Rigid foam j$ a good choice because it is relatively Inexpensive and unaffected by ground moisture. Measure and cut the insulation with a utility knife. Glue it In place with construction adhesive. How to trim a door opening?